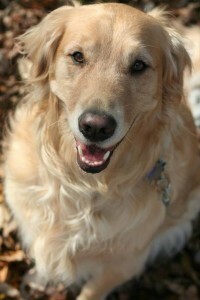 Max is a lovable almost 5 year old golden retriever. He is very protective to those close to him but is so gentle and kind and just wants to be loved. At 8 months old he was diagnosed with hip dysplasia in both hips. Thankfully no action was required then, but he has always had a harder time getting up, though that has never stopped him. 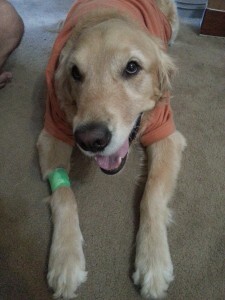 Earlier this year in May, he had a tumor, but after surgery we were relieved to hear it was a benign tumor. In August what we thought was a cut turned into a scab. After taking him to the vet, we learned it was a mast cell tumor. We had the tumor removed, but unfortunately the same week Max had surgery we were in the process of moving from our home state of Michigan to Virginia. My husband is in the Navy, so we didn’t have much choice on when. Max was a champ and handled our move very well. A week later our vet from Michigan called with some bad news, Max had a mas cell tumor with a grade 3. She strongly recommended that we see an oncologist. After our visit with Dr. Waite, we learned without treatment Max was only give 3-4 months to live, putting us right around the holidays. The thought of just moving and losing our beloved pet right away was no option fr us. we started treatment immediately. A month into treatment, his test results came back positive for CKIT. We are now undergoing Palladia for as long as he can tolerate it. We want Max to live as long as he can. We feel he deserves it and will do anything for him.